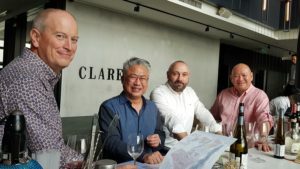 In mid-June, Olly Masters (our winemaker) and I flew to Singapore to embark on South-East Asia soujourn to visit with some of our wonderful wine distributors. It’s always a timely decision to visit Asia when you start facing your first below zero mornings in Central Otago’s chilly winter! Our first activity was some training with the sales team of our amazing Singapore distributor Crystal Wines. The sales team of ten were taken through all the wines and the new vintages and it was great for them to hear first-hand from our winemaker on our style of wines and the impacts of the season on the various new vintages. 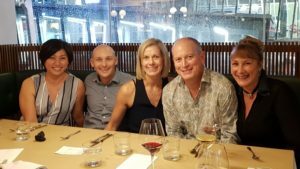 Then we were off to the M Hotel in Shenton Way to set up for our Pinot Noir Masterclass entitled “Pinot Noir – The Winemaker’s Wine”. I was the chair of the session and Olly was the first speaker on our esteemed expert panel, providing the overview of Pinot Noir. After learning everything we could about this variety, we got down to the tasting where he was joined by Lim Hwee Peng, CWE, FWS, and one of Singapore’s most highly regarded wine educators, and Alvin Gho, FWS and Sommelier and winner of many Singapore and South-East Asia sommelier competitions. We presented eight Pinot Noirs from around the world – the examples were from key Pinot Noir regions of the world including Aconcagua Valley (Chile), Yarra Valley (Australia) Burgundy (France), Marlborough (New Zealand), Tasmania (Australia), Willamette Valley (Oregon, USA), and Central Otago (New Zealand). The Pinot Noirs were all from recent vintages and all roughly within a SG $50-$90 price range. Our audience, a sell-out group of over 45 people, comprised sommeliers and other trade guests as well as ‘interested’ consumers. The tasting was done blind and as we revealed each wine it was clear that not many of the audience had been able to guess the origin of the wine. The purpose was not to find a winner but to explain more about this variety and show some of the many styles of Pinot Noir around the world. Of course New Zealand Pinot Noirs perform very well at this price point offering great value for money so hopefully we changed some perceptions during the session. Olly and I then headed to Malaysia to meet up with CK Chew who represents our wines through his company Finlux. Our first stop was a new development that houses the Four Seasons Hotel, and underneath at “Shoppes at Four Seasons Place” is the Atlas Gourmet Market & Bistro. Our friend Nick Loo (ex Sommelier at the Hilton Hotel KL) is in charge of wines here and showed us around his newly collated wine collection and we sampled some great food whilst there. In the evening we hosted a wine tasting event at Lavo https://www.lavomy.com/index in Petaling Jaya. This amazing venue officially described as a Restro Wine Atelier, is home to an impressive repertoire of wine with some saying it’s the largest collection in KL. Over 1,000 labels are on display in their wine gallery including a very impressive Jeroboam collection. 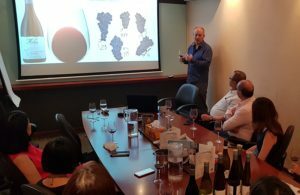 The next day since we had the expert services of our winemaker on this trip, we took advantage of his skills and headed out to Taylor’s University and held a two-hour masterclass on New Zealand wine to final year hospitality students. It’s the second time we’ve visited Taylor’s University; it’s something we like to do when we can so we can inspire and educate the new generation of hospitality professionals about New Zealand wines. Our education efforts in KL also extended to various restaurants which list our wines like the El Cerdo group where more than 20 staff gathered on a Saturday afternoon at The Iberico restaurant to learn more about our wines. A special wine dinner we held in KL was at Brasserie Fritz https://brasseriefritz.com/ which is run by the colourful duo Christian Bauer and Eddie Chew. We have long been working with them at their other stylish venues ie Troika Sky Dining, Fuego, Strato, Cantaloupe etc. It was great to host an event at their latest concept in the heart of KL on Bukit Bintang next to the WOLO Hotel – an exceptional space that feels like it belongs more on a fashionable Parisian street rather than the intersection of Kuala Lumpur’s busiest two streets. And our wine dinner had some exceptionable matches as well with our Rosé paired with a Scallop vol au vent and some anchovies on toast, and a second course featuring “The Cadenza” Late Harvest Gewurztraminer with “Cinnamon grilled foie gras, peanut butter sauce with brioche”. It was an honour to have New Zealand Trade Commissioner to Malaysia and Brunei, Simon Hearsey and his wife Holly join us for the dinner. We also presented our range of wines at Joloko – at a pre-opening party of a new “cozy tropical hangout set up in a little yellow heritage house”. Let me tell you, judging by the pre-opening party, this place will be one of the coolest spots in KL as soon as it gets underway and of course, they’ll be serving Misha’s Vineyard wines. (Opens later in July 2018). 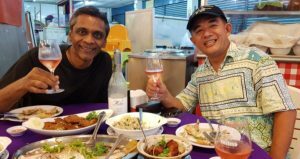 Olly headed back to New Zealand and I went on to Langkawi where we work with SH Maju owned by Alfred Low with Mohan Naidu running the wine business. I hosted a wine tasting event at The Danna Hotel https://www.thedanna.com/en for in-house guests followed by a session for some of the island’s top sommeliers. It was great to meet staff from the St Regis, The Westin Langkawi, Dash Resort and the Four Seasons Hotel and to visit some of the amazing properties on this beautiful island. We are lucky to work with such a great wine distributor in Langkawi. Frost…and why site selection is so important! Te Awamutu, Pauani, Whangamata and more!